Popular, active, multicultural, extroverted: Gràcia is an oasis amid the city bustle. This is more than a neighbourhood, it is a village with its own identity that reasserts its past and has made its festival a must for everyone. 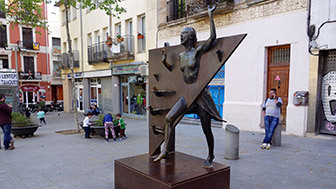 With a thriving commercial life, craft shops and designer boutiques, plus a broad range of leisure and eating options, complete the picture in a neighbourhood that saw the birth of Catalan rumba with its guitars and clapped rhythms . 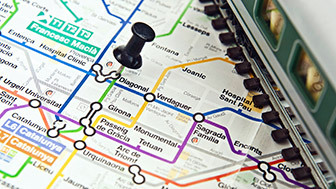 Vila de Gràcia is one of the most charismatic neighbourhoods in the city. It still preserves the small, narrow streets of a rural community, built round the fast-flowing streams that used to pass through it, while its inhabitants proclaim they are proud of being part of Gràcia and of their Gràcia spirit, revived every summer at one of Barcelona's most popular festivals. Vila de Gràcia is a pleasure to walk round and admire. Highly creative shops can be found on every street, while terrace culture has taken root in every square, of which there are many. Any time of day or night is good to pause, sit at one of these terraces and watch life pass by in Gràcia. Until the 17th century, this neighbourhood was nothing more than a few, isolated farmhouses, three convents and the odd villa that the wealthy built as summer houses. But with the dawn of the 19th century came industrialisation and Gràcia became important, as it had land that was available for factories to be built on. That was when Gràcia demanded its independence, which it achieved three times: in 1821, 1828 and 1849. Vila de Gràcia was finally swallowed up by Barcelona in 1897 but before this a major road had been built that would link the centre of Barcelona with this rapidly expanding town: Passeig de Gràcia, which made use of the old road that joined the two urban centres. But industrialisation was not the only thing going on in Vila de Gràcia. For more than two centuries, the Gypsy community that had settled round Plaça del Raspall had been handling the livestock. A wealthy Gypsy community who, like the Gràcia locals, organised their life round its streets and squares. A cradle that mixed flamenco rhythms with Cuban sounds and salsa, brought here by immigrants from the Americas. The result: Catalan rumba, a typically Gràcia style of music. Gràcia has many faces. Modernista Gràcia, which saw the first buildings built by the architect Antoni Gaudí, such as Casa Vicenç, on the edge of Plaça Lesseps; the Gràcia of iconic squares, such as Plaça de la Virreina, Plaça del Diamant, which Mercè Rodoreda turned into a novel, Plaça del Sol, with its multiculturalism, and Plaça de la Revolució, republican and liberal; the Gypsy Gràcia of Catalan rumba and the Gràcia of independent theatres, such as the Lliure; the Gràcia capable of mixing local residents with the most Bohemian modernity of the artists who set up their workshops there. Fun is strolling round Gràcia, exploring a world of curious shops, full of new crafts, old and modern designs, amusing yourself in stately homes, enjoying fresh air in the squares or watching art house films. Day or night. There is always something going on in Gràcia. Plaça del Diamant oozes the ambience of the village that Gràcia was in former times. 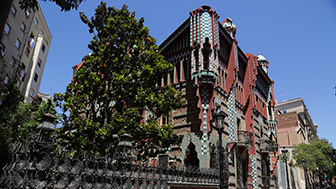 Casa Vicens is one of Antoni Gaudí's first works in Barcelona.